This page changes often. Please check back for added and updated events. For the most updated events information delivered right to your E-mail please click HERE to join Swiftreach. Our events are all thanks to the hard work of our Mine Hill Community Committee. If you are interested in joining the Community Committee or volunteering opportunities please contact us directly. 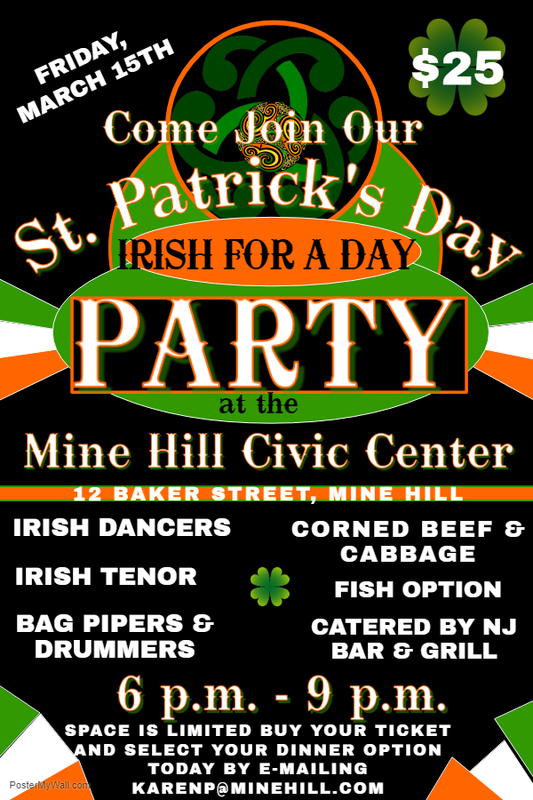 St. Patrick’s Day Irish for a Day at Mine Hill Civic Center. $25.00 per person. Join us for entertainment such as Bagpipers and Drummers, Irish Tenor and Irish Dancers. Two food options for the evening are: corn beef and cabbage or a fish option. To make your reservation please click HERE to register online. In order to complete your registration you must pay by March 13th. Payment may be dropped off in the payment drop box located in front of town hall, in person or by mail. If you have questions about registering please contact the Community Programs Department. Information Listed at the top. Make your reservation today! Click HERE to go to the reservation portal. 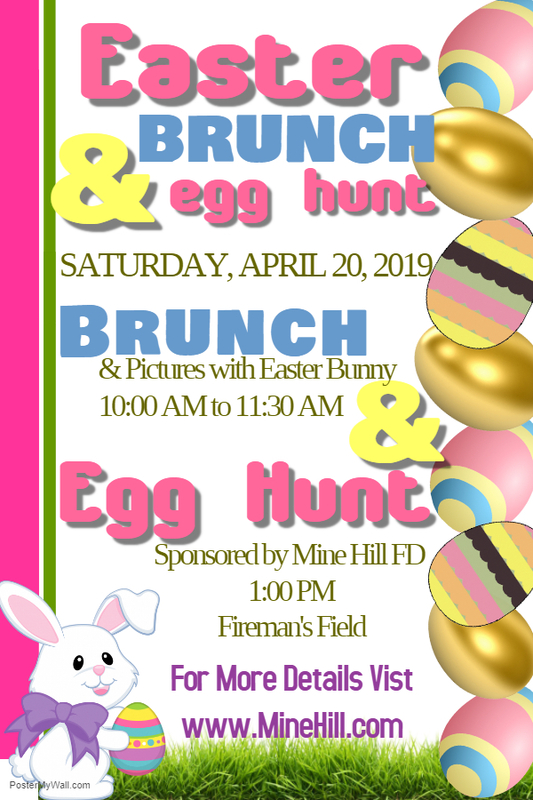 Come join us for brunch with the Easter Bunny from 10:00 AM to 11:30 AM at the Mine Hill Civic Center, 12 Baker Street, Mine Hill. We will be offering french toast, home fries, sausage, scrambled eggs. Beverages provided will be tea, coffee, orange juice water and milk. The Easter bunny will be hoping on over to see everyone at the brunch so don’t forget to bring your camera! For questions on you reservation or need help please go to the contact us information at the top of the page. Thousands of candy filled eggs with 20 golden eggs which win prize baskets. Free admission, refreshment sales, 50/50 drawing and a prize basket raffle. The Township is hosting a Town Wide Yard Sale Event. We recommend the hours of 8 AM – 5 PM. The list will be publicized. Permit requirements and fees are waived, but you must sign up. To access the List of Addresses participating in the garage sale please click (link under construction). For access to the map of the addresses participating in the garage sale please click (link under construction). On the page you have the option of customizing the map to see which addresses are participating in the garage sale by checking off or un-checking off the box to the left of the date. The drop down arrow also provides a list of all the houses associated with the blue pins. You can print the map by clicking on the 3 dots in a vertical row to the right of the magnify glass and click “print map”. Our annual town wide food drive helps our fight against hunger in our town. In collaboration with Scouts and the Community Committee we will be collecting donations for the Mine Hill Food Pantry. Suggested donations are available under the Food Pantry page. Santa’s Mailbox is open and available anytime to drop off your letter. Santa will write back to you only if you include a return address. Mine Hill Civic Center, 2 Seatings at 9:00AM and 10:45AM, Price: $5.00 per person, Seating will be limited. To enter please have your holiday lights on and the Community Committee will go around town determining the winners. We will notify the winning houses with a letter indicating you’ve won, and to please come to the December 21, 2016 Town Council Meeting to receive a certificate. Santa comes to town. Santa will make his trip around to all the good children of Mine Hill this year beginning at TBD. For route information stay tuned to updates on swiftreach! Proceeds will benefit the Mine Hill Food Pantry.